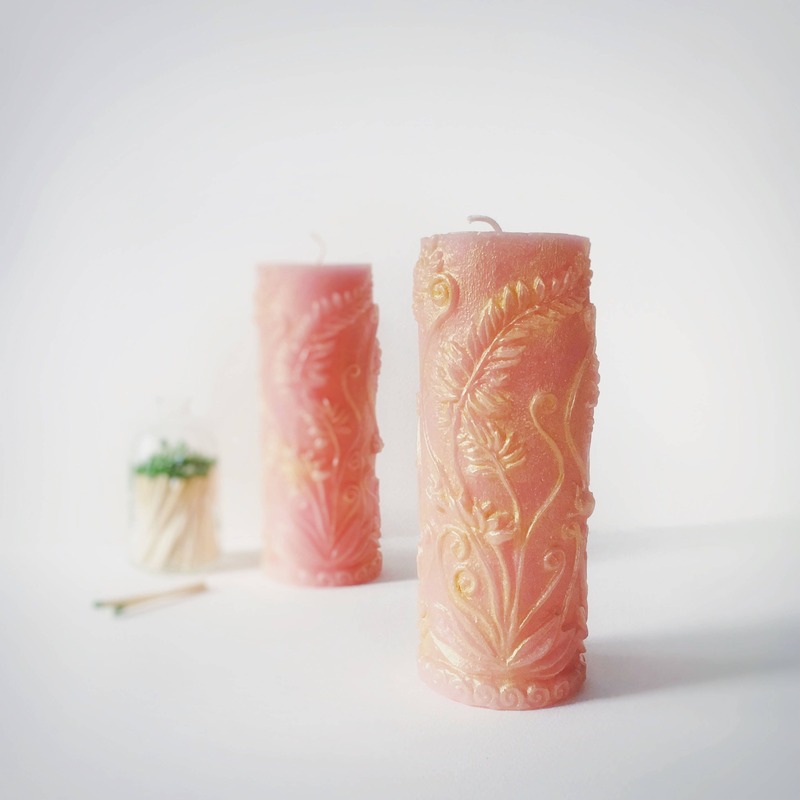 A beautiful, rose gold, fern-relief pillar candle, made from pure beeswax. Handmade, one at a time, by me in my Hudson Valley NY studio. Beautiful beeswax candles have a gentle, natural honey scent, burn longer and brighter than other types of wax candles, and are considered “dripless,” if burned correctly, undisturbed, away from any drafts, and in a properly sized holder appropriate for burning candles. There is no guarantee that beeswax candles will not drip or run, so appropriate precautions should be taken to avoid melted beeswax getting on tablecloths, surfaces, etc. This listing is for one, rose gold, fern-relief beeswax pillar. Each 2.5" x 6.5" pillar is 16 oz and burns for 60+ hours! A golden hue of pastel pink ,,,,, flora and fauna relief ,,,,, A reminder of Spring tulip and rose v i n e , , , , , , a color that softens and drapes both the liturgy and joy of E a s t e r ,,,,, Well Wrapped and placed in a new Sturdy Shipping Box ,,, , , , , Seasonal Shipping at It's B e s t! Realky beautiful quality, and they look even better in person. We are so excited to use these in our wedding ceremony. I received this candle yesterday and it's perfect! I love the color! I purchased the small tapered candles to go along with this candle and they are beautiful together. This will be used at the baby shower for my first granddaughter. Thank you for getting them to me in such a timely manner when you were going through a difficult time. This candle is more beautiful in person than I imagined it to be and the customer service was considerate and personal. I can't wait to order more!